Photographer: Emma Summerton. Model(s): Daria Strokous. Source: Vogue China. 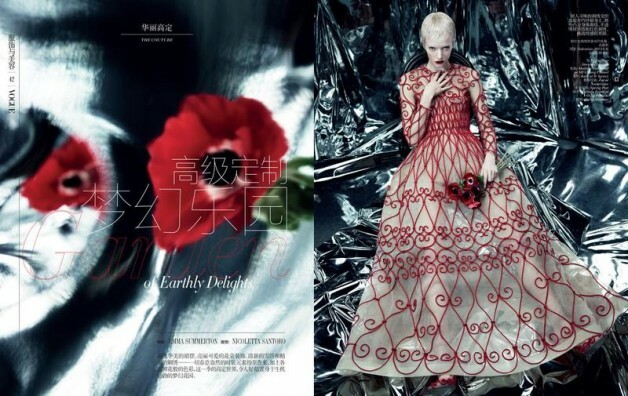 Daria Strokous enters a high fashion funhouse in ‘Garden of Earthly Delights’ by Emma Summerton for the Spring 2013 Collections issue of Vogue China. Playing with the elements of avant-garde illusion, Summerton showcases this season’s standout pieces, in a series of dream-like sequences set against a backdrop of mirrored magic. Drowning in a sea of decadent distortions, Strokous melts into the mylar in a twisted mix of fashion & fantasy. Caught in the couture cross-fire of haute hallucinations, the funhouse like effects elevates the creative aspect of the editorial, allowing us to get lost in our imagination. An inspired piece of visual artistry, the beautiful blend of real and reflection takes this layout to the level of full blown fashion art.